But Does He Still Eat Pie? Tune in to this episode of Columbus! Something New to enjoy our interview with Kayla and Eric of Winks & Whiskers, and we chat about the German Village Art Crawl, 4th Street Farms, Bottoms Up Coffee Co-op, The Sunlight Market, and the Promowest Fest. In addition to a busy family weekend, Burke and I managed to do a couple of extra things. Kayla, Eric, creators of Winks & Whiskers, and their fur-baby Sadie, met us for an interview at Wheeler dog park. Noticing there was a missing element in the graphic t-shirt market, Kayla and Eric have developed a sharp line of graphic t's for the dog lover in all of us! Kayla and Eric sat down with Jessica, Burke and me to talk about Sadie's adoption, all the wonderful things that make Sadie, well, Sadie!, creating their business, and their exciting plans to travel across the country! Later Saturday evening, Burke and I went to Macon Alley in German Village for the Art Crawl! We spent lovely time together strolling through the streets of German Village on our way to the crawl from the car! 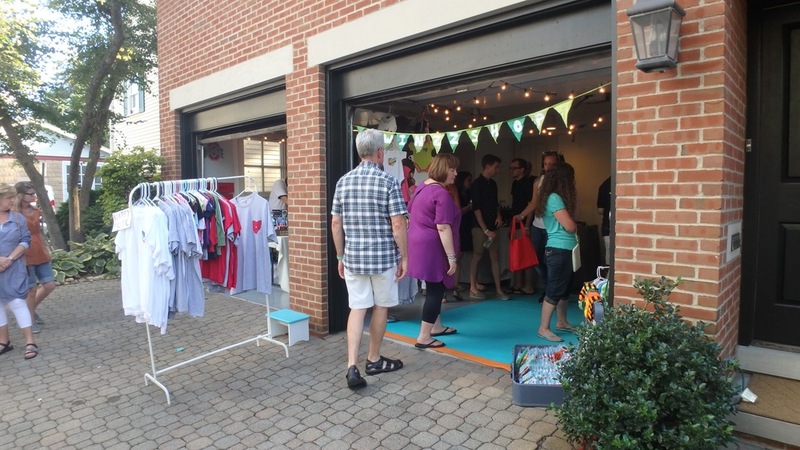 Once we made it to the crawl, we browsed through open garages filled with local artists and their work! Check out the work by Joshua James Stewart I brought home! As she does every week, Jessica shares her Columbus itinerary with us. As this week is the Franklin County Fair, Jessica let us in on some big trivia! Little did Burke and I know we were so close to fame. 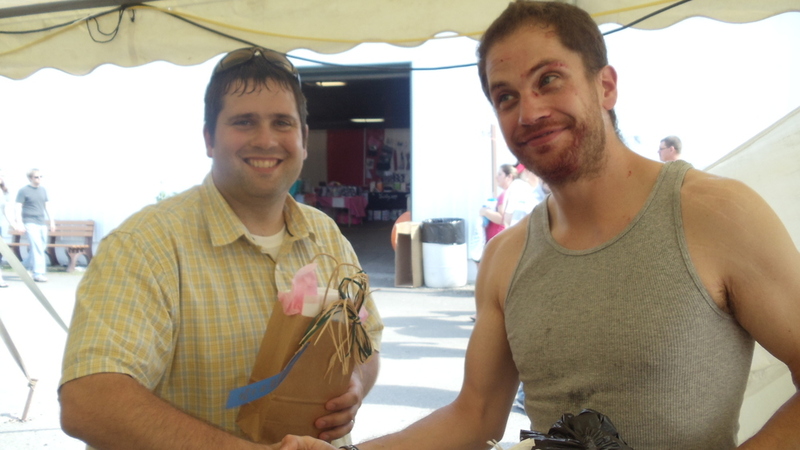 Jason, Jessica's husband, is the 2013 pie eating champion of the Franklin County Fair. He was the first one to eat an entire Der Dutchman berry pie, clean plater. See photo of a proud, and full, Jason. During the week, Jessica and Jason visited the newly opened Bottoms Up Coffee Co-op. This coffee shop is based on the idea, "customers and members are saving babies and strengthening the neighborhood. Proceeds from our coffee shop fund local non-profits and innovative ideas that reduce infant mortality. Our members donate time to facilitate workforce development classes for Franklinton residents." 4th Street Farms was visited by Jessica and Jason. This farm "is a community-driven initiative to eat, empower, educate, and employ skills together." While there, they go to see Weinland park artist Aaron Thomas as he painted a Little Free Library. As Jessica's One More Thing, she wants us all to take a look at a Passion Flower, and how unique and unusual it is! In addition to everything else, they spent two days at Promowest Fest! New Ohio Wrestling presents NOW 3: Boone vs. Taylor - LIVE!